In an interview given to kath.net Cardinal Schönborn, the Archbishop of Vienna, has made more comment about his time spent in Medjugorje recently . He said that it was rather unusual for a Cardinal to visit Medjugorje as a pilgrim but has since discovered that several other cardinals and bishops had been there, but in a very “private” way. He added that Medjugorje is now one of the greatest pilgrimage sites in the world to travel to. The cardinal also confirmed that Medjugorje had played an important part for many young priests on their personal path to the priesthood. He referred to the annual Youth Festival at Medjugorje and said that, other than Taize, there is no other place that gathers so many young people and that this reflects the global importance of the phenomenon. Cardinal Schönborn revealed that he had listened to Confessions for two and a half hours in Medjugorje, and that many of the penitents had not received the Sacrament for 20 or 30 years. “How does this tree bear such fruit?” the cardinal asked. He went on to speak about the phenomena of apparitions around the world and said that apparitions have their own language, that they provide simple uncomplicated messages which can get to the heart of the Christian message. He said that in Medjugorje the messages have a distinguishing feature with Our Lady’s call to peace and revealing herself as the Queen of Peace. The cardinal confirmed again that the official position of the Church is as the Zadar declaration of 1991 made by the Yugoslav bishops’ conference. He said that this declaration has been confirmed at least twice and an ideal guideline to keep to. On the question of the Church providing a definitive ruling when the phenomena are completed the cardinal said that there are many Marian apparition sites where an ecclesiastical verdict is not pronounced but still pilgrimages take place. He also stressed that `official’ pilgrimages to Medjugorje (pilgrimages organized at diocesan level) cannot take place but support will be given to the spiritual needs of pilgrims who go there. The cardinal also pointed out the deep level of prayer witnessed at Medjugorje and that the pilgrims show an incredible desire to return. He said that he could only explain that the closeness of Our Lady is good for the people and that he definitely wants to return to Medjugorje. 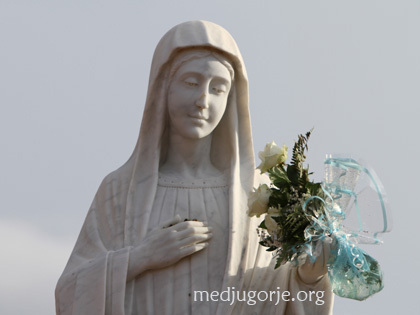 When asked if Medjugorje was a place of grace the cardinal said, To doubt that grace flows from Medjugorje, it would be necessary to close our eyes and the evidence was very obvious that graces spring from Medjugorje. As to the messages and locutions cardinal Schönborn said that when Rome investigated the claims of Sr Faustina, who received daily messages from Jesus, it was very critical but the phenomena stood the test of time. He emphasised that the Church is always very cautious in this respect and it is a good thing. He then added it was also very important that the fruits are not hampered and he was particularly impressed by the amount of good works resulting from the Medjugorje. He specifically mentioned the Cenacolo Community and Mother Village founded by the late Fr Slavko Barbaric. He spoke about Medjugorje in the light of the Second Vatican Council and the “sensus fidelium”, the faith of the people. He said that the messages play an important role for pilgrims to stay “connected” to Medjugorje and that without the initial momentum there would be no Medjugorje today, but he did not want to speculate “recognition” and that for him as a bishop it is important that nothing in the messages is contrary to faith. He added that in this time Our Lady manifests herself as Queen of Peace and that is the theme of the messages from Medjugorje, peace with the emphasis on conversion, because when we are peace with each other we are peace with God. The cardinal was asked that in the light of people’s lives changing at Medjugorje is there anything he does differently since his vist. The cardinal responded by saying that if there was, he would not say, but he knows through a long association with Lourdes that a close union with the Mother can lead to God. He stressed the pastoral care of Our Lady in bringing people to her Son and how her words can touch hearts and get people to say “Yes”. When asked if he would report his impressions to the Holy See, the cardinal stated he went on pilgrimage for personal reasons but he does not conceal his attitude to Medjugorje from his brothers, which has deepened since his visit. He confirmed that he has spoken with many bishops and will continue to do so and that this was part of the Church view and judgment. He added that as a visiting Cardinal to Medjugorje it brought consolation to the people who were there on New Year’s Eve. great to see, that bishops and cardinals,are speaking about medjugorje. Mary always said be ,we have to wait, .the recognition, does not matter realy, but at last they are having a open heart, i think that is what our blessed mother is asking for. she always said to be obediend,to the church. and that is something the seers have always done, and never complained. thank you Jesus and Mary.For lisning to our prayers.. It is a sad experience that most clergy and church leaders today find it hard to accept the miracles and apparitions of the Blessed Virgin Mary. The Blessed Virgin Mary is true. She is most present in the most of the hopeless cases. I got sick very much that I could not bring to function anymore in 2005-2007. While in bed, the Blessed Virgin Mary gave me strength and consolation by giving me a miracle. The medal of the Our Lady of Medjugorje which I wore, disappeared from my neck, and after three days, it reappeared on my neck attached on the thin thread of rope that I was wearing. So many people had yet to believe, and if we leaders don’t manage to believe. How about the rest of the hungry souls waiting to know? I am not saying that I am not a sinner. Cause I am. And I am ashamed to admit how easy it is for me to curse God and blame Him and emotionally hurt my mother(my mother is cripple) and I don’t have a father), if I cannot manage myself to do simple things of household chores nor have to force myself to help my mother because of my “emotional crippledness”. I find it hard to live sometimes. If all these things happen to me, I draw strength from our Mother Mary( Our Lady of Medjugorje). I hold on to her miracle to me– the disappearing and appearing of the Our Lady of Medjugorje medal on my neck. Until now I am sick, cause I don’t know when I will be afraid and discouraged but always there is the Blessed Virgin Mary, our hope and reminder of God’s grace. My mother died at age 90, she had an afterlife experience and was returned by an angel back into her body and lived another 6 years. I visited Medjugorje last November. A memorable time as I have never witnessed before. A time where our Lady speaks to you through Nature. I want to return to Medjugorje so much but my finances will not allow. Please dear Mother call me again to experience the love and beauty you have shown me and my husband at Medjugorje. I want to be there again. I heard several yearss ago in medjogorje apparitions of Our Blessed Mother the Virgin Mary, but only very recently I read the full text of testimonies from various people faithful of the blessed virgin and of Jesus of the graces they received, so with the cardinals who went there, through this technology, but I never doubt it. I long to visit this holy site, but for financial constrains, my longing remains, however, trusting on God’s Divine Mercy and by Divine Providence, may His Wll be done, to both of us and my husband to go.